Inside Game no. 8: Michaela Tracy - Salt Pump Climbing Co.
Michaela Tracy on "Numb Thumb" (V7) at Pawtuckaway State Park. Michaela Tracy has always struggled to define ho­­me. The daughter of two American ex-pats, she was born in London, where her father Jack worked for more than twenty years. As she spent the majority of her early life in the UK, Michaela is a citizen of both countries - although growing up, she never really considered herself an American. Perhaps Tracy’s upbringing in a culture not quite her own helped her to develop what she considers one of her strengths - a preternatural ability to remain focused and grounded in new environments. Michaeala competing at age 11 in England. photo: Jack Tracy. In 2017, Michaela finished the Word Cup Bouldering series ranked 8th in the world. At the same time this year was also marred by injury. Since relocating to Maine, Michaela’s managed to stay up to speed indoors and out. 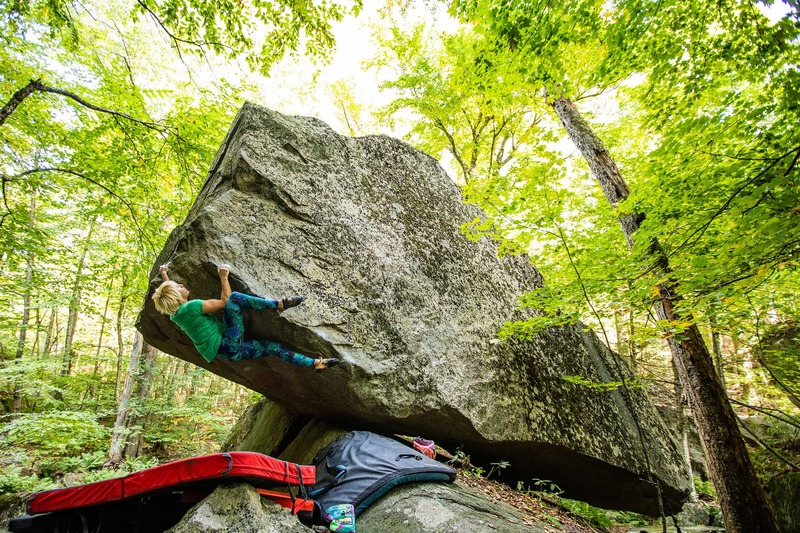 She recently ticked Halcyon, a benchmark V11 in Pawtuckaway, and then won at the most recent Dark Horse Climbing Competition a few weekends later. 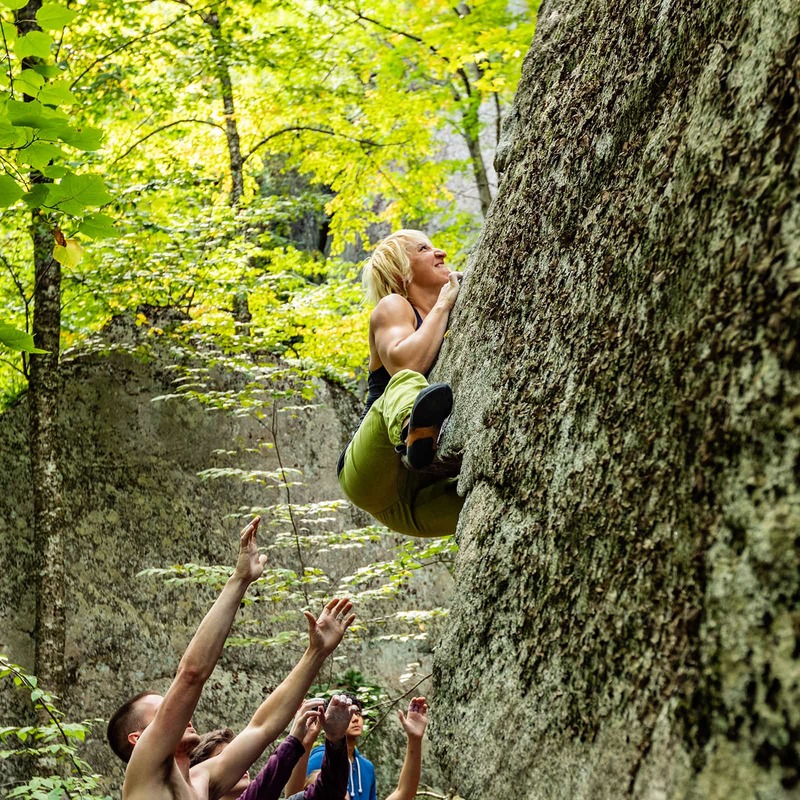 How did you get into competitive climbing? Well, I competed as a junior from the age of twelve to seventeen, mostly in roped climbing. I was part of the Westway Squad – my home gym in London was called the Westway.Then I took aboutafour year break, and started up again in bouldering at the age of twenty-one. I’ve been competing solely as a boulderer ever since - which is around six years now! 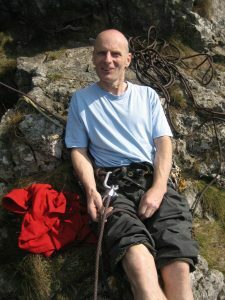 I had a really interesting group of coaches – some of the best climbers who were around in the UK at that time. A guy named Adrian Baxter who was really strong, and Neil Gesham. I trained with a guy named Zippy for a long time, who was a friend of my Dad’s and a really strong climber in the 1980s; we did a lot of old school training –a lot of campusing, a lot of power stuff. Zippy had a healthy attitude to competitions – he didn’t really like them. I guess he was a bit of a nihilist, he didn’t believe in the importance of anything more than for its own sake… I guess that’s reflected a little in my approach to competitions. He was also really key in demystifying the idea of famous climbers. He always told me that it doesn’t matter - they’re just people. What was his training philosophy? It was really, really old school. We’d do these horrible campus exercises which only stopped at complete failure. Trying hard is something that you can train, and have to train… because it’s really hard… to try really hard. If you train that ability to try really hard, then it’s easier on the wall.You can’t just rock up and try hard, you need to be accustomed to what it feels like. I don’t think I’m the strongest person, I’m not the fittest person, definitely not the lightest person… but I try hard. Michaela on "Up in Smoke" (V7). "I have this disease, I can't lock off," she says in jest. 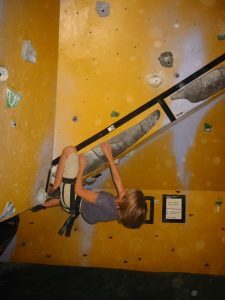 Any competitions, performances, you remember from those early days as a climber? They had this national lead competition called The Sky Masters, I wasn’t even going to go until that Thursday but Adrian rang me. It was this crazy event at a massive exhibition centre where they’d suspended all these structures from the ceiling, and some of them moved. Everyone in the UK was there I was maybe, fifteen or sixteen… and somehow Itopped the final route and got first. I won fifteen hundred pounds and a big glass star-shaped trophy - the only oneI’ve ever kept. Why did you decide to take a break from competitive climbing? I had been competing since I was twelve years old, and by seventeen I took it really seriously and I was really pressurizing myself… I wastraining for routes, and pushing myself to the point where I ended up having some issues with eating, I got way too light and I had to stop competing because of it. Gaining that weight again, it was quite difficult to get back into route climbing, or competing anyway, and I had just moved to Sheffield and didn’t know many people - I ended up just bouldering a lot by myself. I worked building climbing walls for a bit, and then went on a really long van trip around Europe. I was definitely still climbing, I just didn’t want to compete. In the UK it’s not something that’s really talked about openly– it’s getting better now, but still there are people competing internationally who shouldn’t be allowed to because they are clearly ill [with eating disorders]. When you go to a competition in the United States, it’s good to see that most people look pretty healthy. Maybe because the emphasis over here is more on power… you can’t afford to be really slight and be able to do all the moves. Speaking of which, tell me about your connection to New England? I’ve been coming to New England for a long time. My parents had a house in Jackson, New Hampshire - which is where my Dad lives now. We used to fly here every Christmas and summer holiday, and most Easter holidays as well. In the summer we always used to make at least one excursion to Portland and to Higgins Beach. I’ve done a lot of hiking in the White Mountains, a bit of climbing at Rumney and Pawtuckaway. This has always been… a home. One of my memories is of belaying my dad on a 5.12b at Sundown, Eyeless in Gaza, the time he sent it… I was probably too small to be belaying him, and basically neither of us were expecting him to do it, but to both of our surprise he managed to make it past the crux and not fall off before getting to the top. That was a great thing to be able to share with a parent. What's been the most interesting thing you've learned since becoming a coach? Well, the kids taught me how to do a handstand which is pretty cool. I could never do a handstand before, but now I can do one for a couple seconds! Okay let me start over. Firstly, it has taught me to really think about how I move when I’m climbing and what I’m doing, because I need to be able to try to explain it. Because I’ve been climbing since I’m nine, I’m an intuitive climber… I don’t necessarily think about what I’m doing when I’m climbing. But having to think about it has made me a better competitor, if not a better climber… Also it’s forced me to look at the way I train. I can’t be telling kids to work their weaknesses if I’m not working mine. Seeing how hard they try, and how hard they work, it’s really inspiring. The kids are also kind of like my training partners… It’s great when I get burnt off by one of them. That motivates me to try harder. 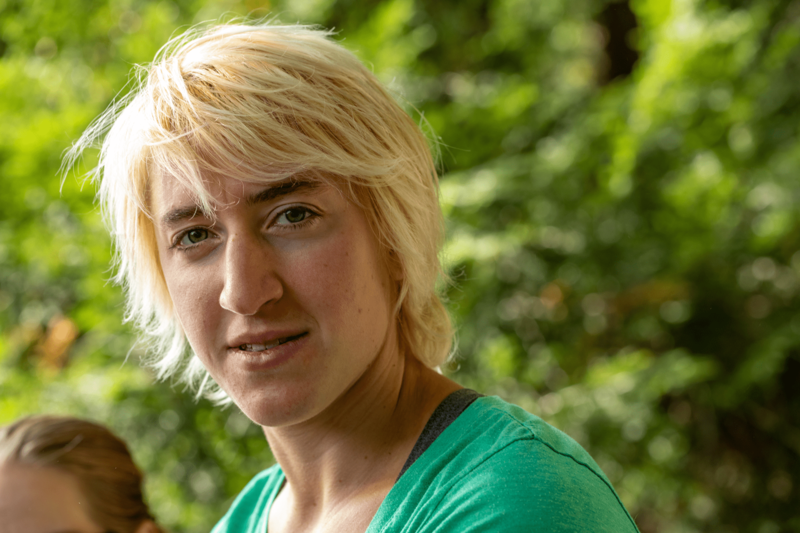 Michaela is sponsored by Scarpa, Friction Labs, Organic, and 3rd Rock. Pawtuckaway photos by Angie Payne Photography.